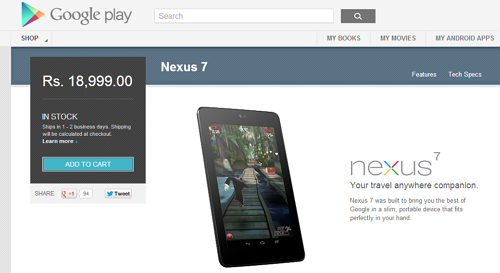 Google Nexus 7 32GB version Android tablet now available in India through official Google Play Store for Rs Previously Google has launched Nexus 7 (16GB) tablet in official Google Play Store in India. The tablet features 7-inch IPS Scratch-resistant corning glass with resolution of 1280 x 800 pixels. 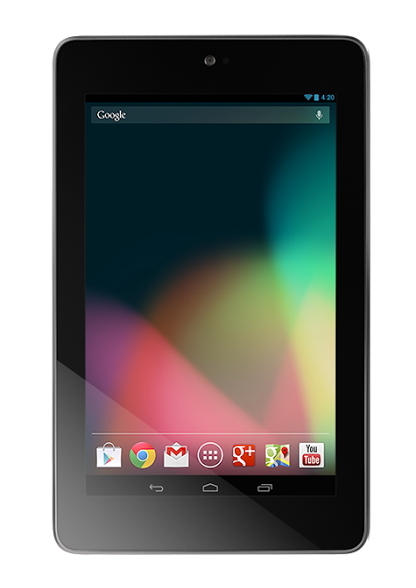 The tablet powered by 1GHz Nividia Tegra Quad-core processor and runs on Android 4.2 Jelly Bean operating system. It comes with 1.2 megapixel camera, and both WiFi and bluetooth connectivity. check complete tech specs below. 7-inch Full HD IPS Diplay with resolution of 1280 x 800 pixels. You can buy Google Nexus 7 tablet from here, Google takes 2 business days to deliver your goods after you have successfully buy the device.